I bought this kit a few months ago at a local hobby shop. It was released by Academy without much anticipation by the modelling community. 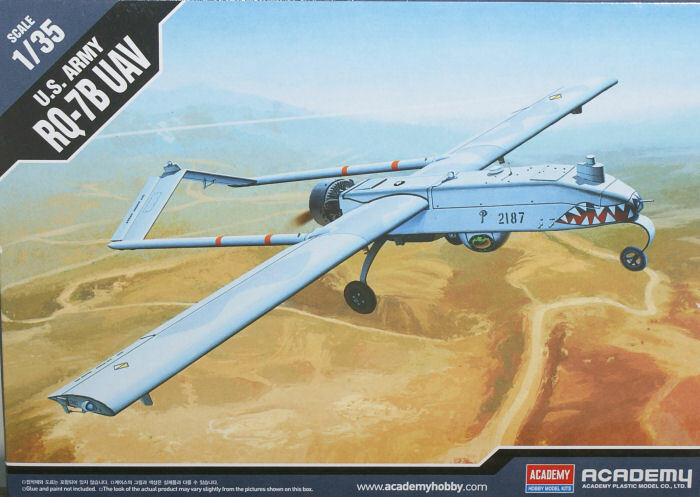 The RQ-7B is a UAV used by the U.S Army and Marines as well as some other countries, for surveillance, target acquisition and battle damage assessment. The kit is very simple but also really nice. You got the UAV plus two figures and a display base. For the operating crew, Academy added a decal sheet with the camouflage pattern of the uniform. The decals look nice and are printed by Cartograf. This does not looks like a complex model and will certainly show up in any collection of military figures or in a small diorama.